As a self-defined Route 66 junkie, I’m thrilled to see more guidebooks on the Mother Road. Some are better than others, and that’s certainly the case with Amy Bizzarri’s, The Best Hits on Route 66. If nothing else this well-illustrated guide gets you in the mood for a road trip; but beyond that, it’s filled with useful information on a plethora of roadside attractions along the way. Divided by state, each section includes a handy map with the attractions noted. I’m not sure what Bizzarri’s criteria was for picking the “best hits”, but I’m glad she included some of the quirky lesser known stops, like the Albuquerque Rattlesnake Museum, Glenrio Ghost Town and the Mine Shaft Tavern. Of course she also lists the old familiar haunts including the Snow Cap Drive-In, the Wigwam Motel and Cadillac Ranch. Also included are specialized itineraries for kids, music lovers and movie fans, as well as a general week-long itinerary. And there’s a fun Route 66 selfie challenge at the end. From the ledge of the Willis Tower Skydeck in Chicago, to California’s Santa Monica Pier, there’s something for just about everyone along this historic highway, and Bizzarri does her best to bring it to you. There’s no access information in the book – so you’ll have to rely on me for that – but this book is definitely a good starting point for that cross country adventure. So check it out at https://www.amazon.com/Best-Hits-Route-66-Essential/dp/1493036904. 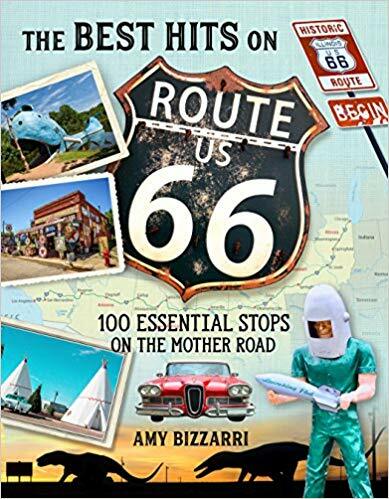 This entry was posted in Book Reviews, Road Trips and tagged book, guide, road trip Amy Bizzarri, route 66 by Candy B. Harrington. Bookmark the permalink.